BBC Latest News - Doctor Who - Asylum of the Daleks Premieres 1st September But They’re Back on Monday! Asylum of the Daleks Premieres 1st September But They’re Back on Monday! We are delighted to confirm that the Doctor returns to BBC One on Saturday, 1st September with the incredible, Asylum of the Daleks. But you won’t have to wait until then for new Doctor Who as Pond Life premieres online on Monday, 27th August. Matt Smith returns as the Doctor and called Asylum of the Daleks ‘a cracker’, adding, ‘Steven [Moffat] has written an absolute belter and we have made the Daleks scary again’. But before that, we have Pond Life to look forward to! Featuring the Doctor, Amy and Rory, this five-part mini-adventure premieres on this site at noon on Monday with parts 2-5 stripped daily across the week. Written by Chris Chibnall and directed by Saul Metzstein, the omnibus version of Pond Life will be shown on the BBC’s Red Button on Saturday, 1st September. 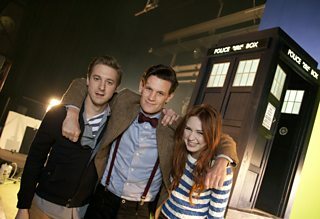 We’ll be bringing you more about the new series and Pond Life soon!